Alfred Nobel, in his last will and testament, stated that his wealth be used to create a series of prizes for those who confer the "greatest benefit on mankind" in the fields of physics, chemistry, peace, physiology or medicine, and literature. 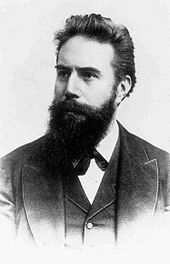 Though Nobel wrote several wills during his lifetime, the last one was written a year before he died and was signed at the Swedish-Norwegian Club in Paris on 27 November 1895. Nobel bequeathed 94% of his total assets, 31 million Swedish kronor (US$198 million, Euro€176 million in 2016), to establish and endow the five Nobel Prizes. Due to the level of skepticism surrounding the will, it was not until April 26, 1897 that it was approved by the Storting (Norwegian Parliament). The executors of his will were Ragnar Sohlman and Rudolf Lilljequist, who formed the Nobel Foundation to take care of Nobel's fortune and organise the prizes. Three Nobel Laureates in Physics. 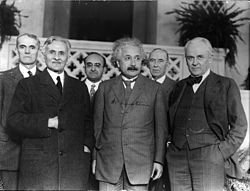 Front row L-R: Albert A. Michelson (1907 prizewinner), Albert Einstein (1921 prizewinner) and Robert A. Millikan (1923 prizewinner). A maximum of three Nobel laureates and two different works may be selected for the Nobel Prize in Physics. Compared with other Nobel Prizes, the nomination and selection process for the prize in Physics is long and rigorous. This is a key reason why it has grown in importance over the years to become the most important prize in Physics. The Nobel laureates are selected by the Nobel Committee for Physics, a Nobel Committee that consists of five members elected by The Royal Swedish Academy of Sciences. In the first stage that begins in September, around 3,000 people – selected university professors, Nobel Laureates in Physics and Chemistry, etc. – are sent confidential forms to nominate candidates. The completed nomination forms arrive at the Nobel Committee no later than 31 January of the following year. These nominees are scrutinized and discussed by experts who narrow it to approximately fifteen names. The committee submits a report with recommendations on the final candidates into the Academy, where, in the Physics Class, it is further discussed. The Academy then makes the final selection of the Laureates in Physics through a majority vote. 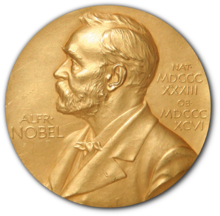 The rules for the Nobel Prize in Physics require that the significance of achievements being recognized has been "tested by time". In practice, it means that the lag between the discovery and the award is typically on the order of 20 years and can be much longer. For example, half of the 1983 Nobel Prize in Physics was awarded to Subrahmanyan Chandrasekhar for his work on stellar structure and evolution that was done during the 1930s. As a downside of this approach, not all scientists live long enough for their work to be recognized. Some important scientific discoveries are never considered for a prize, as the discoverers die by the time the impact of their work is appreciated. A Physics Nobel Prize laureate earns a gold medal, a diploma bearing a citation, and a sum of money. At the awards ceremony, the laureate is given a document indicating the award sum. The amount of the cash award may differ from year to year, based on the funding available from the Nobel Foundation. For example, in 2009 the total cash awarded was 10 million SEK (US$1.4 million), but in 2012, the amount was 8 million Swedish Kronor, or US$1.1 million. If there are two laureates in a particular category, the award grant is divided equally between the recipients, but if there are three, the awarding committee may opt to divide the grant equally, or award half to one recipient and a quarter to each of the two others. For a more comprehensive list, see List of Nobel laureates in Physics. ^ "All Nobel Prizes in Physics". Nobelprize.org. Nobel Media AB. Retrieved 2016-01-19. ^ von Euler, U.S. (6 June 1981). "The Nobel Foundation and its Role for Modern Day Science" (PDF). Die Naturwissenschaften. Springer-Verlag. Retrieved 4 May 2015. ^ "The Nobel Foundation – History". Nobelprize.org. Archived from the original on January 9, 2010. Retrieved 2015-05-03. ^ "Nomination and Selection of Physics Laureates". nobelprize.org. Nobel Media AB 2016. Retrieved 6 October 2016. ^ "50 year secrecy rule". Archived from the original on May 1, 2015. Retrieved May 6, 2015. ^ Gingras, Yves; Wallace, Matthew L. (2009). "Why it has become more difficult to predict Nobel Prize winners: A bibliometric analysis of nominees and winners of the chemistry and physics prizes (1901–2007)". Scientometrics. 82 (2): 401. arXiv:0808.2517. doi:10.1007/s11192-009-0035-9. ^ "A noble prize". Nature Chemistry. 1 (7): 509. 2009. Bibcode:2009NatCh...1..509.. doi:10.1038/nchem.372. PMID 21378920. ^ "The Nobel Prize for Physics and Chemistry". Retrieved 2 October 2018. 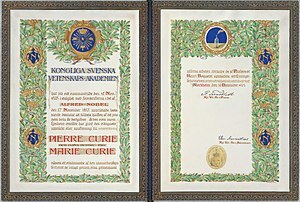 Wikimedia Commons has media related to Nobel Prize in Physics.